Big Bear Cafe has a 14-seat space, a big chalkboard menu, a community bulletin board, and plenty of light. 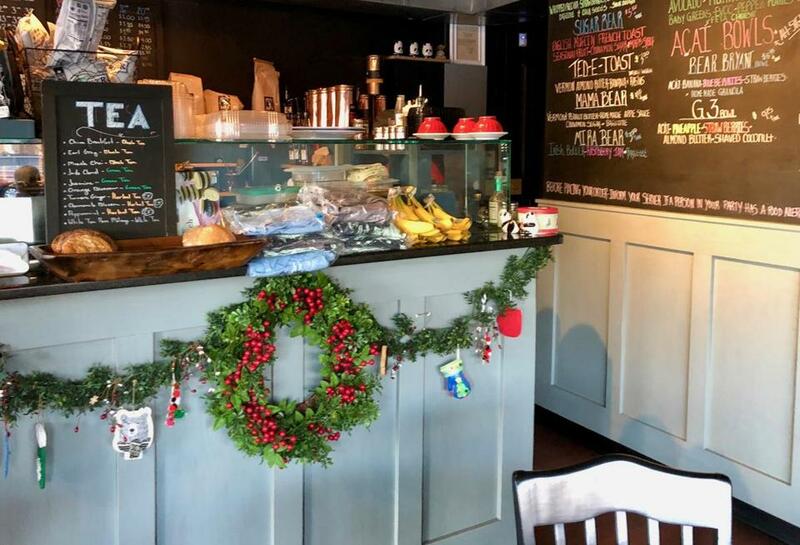 WHO’S IN CHARGE Big Bear Cafe + Espresso Bar owner Donna Menna is the heart and friendly soul of this cozy eatery in Dedham Square. After spending almost 15 years as the general manager of Todd English’s Figs restaurants (first in Wellesley, then Beacon Hill, then Charlestown), Menna knows the hospitality industry inside and out. Unlike Figs, Big Bear is small, and Menna works food and drink from behind the counter while simultaneously fulfilling the front of house duties that make guests feel they’re in good hands. She greets and serves everyone, instructs her (very good) counter people, chats with locals, is unobtrusively attentive to new guests, and makes sure everybody has what they need. In the two-plus years since it opened, Big Bear has become what Menna dreamed it would be: a real “third place” (not home, not work, but a third place) where the community can gather for carefully crafted espresso drinks, teas, and something good to eat. THE LOCALE Dedham Square — just off the beaten track to Legacy Place — has become a vibrant community center in the past few years. Somehow it has escaped the lifeless fate of some small New England towns overtaken by large shopping and “lifestyle” centers. Big Bear is in the heart of the square, in a storefront with lots of windows. The 14-seat space has a big chalkboard menu, a community bulletin board, plenty of light, and — joy of joys — sidewalk tables for the warm months. There’s even a permanent chess/checkers board on a tabletop out front. ON THE MENU I’m nuts about very good espresso drinks, and Big Bear does them really well. Not only that, but Menna serves her cappuccinos ($3.50) in beautiful, double-walled thin glass cups, which I love. The best cafes also serve some food — and not just pastries, but savories, too — for when coffee makes you need some grounding! And, Big Bear’s menu obliges in all departments. There are wonderful toasts topped with lots of different combinations of ingredients. Savory toppings include avocado, hummus, bacon, and cheeses while sweeter versions have pleasing layers that include ricotta, natural nut butters, fruit, honey, maple syrup, and more. For larger appetites, a half dozen sandwiches will please both vegans and omnivores. There are pastries, from Arlington’s Danish Pastry House, and specialties, including acai sorbet and fruit bowls. I’m always happy to find a good tuna salad, and Big Bear’s Daily Catch ($7.50)— has just the flavor I like. Two scoops of tuna are served atop two naan breads and covered with greens, cherry tomatoes, and drizzles of sweet balsamic. Eat it as a salad or fold up the naan breads and have yourself two “fish tacos” as the menu playfully describes them. Smokey the Bear ($8.75) is a delicious smoked turkey sandwich constructed with layers of creamy avocado spread and jalapeño mayo, Havarti cheese, and greens on a nice roll. I liked all the toasts I tried on a couple visits. The Yogi & Boo-Boo toast ($6.50), with hummus, cukes, avocado spread, feta cheese, and baby greens, is a winner. And several of the breakfasty toasts I had were homey and good: the Ted E. Toast ($3), with almond butter and banana slices on seeded wheat; the Beary Good ($6), with ricotta, strawberries, and blueberries on sourdough; and the simpler, cinnamon toast-inspired Honey Bear ($3), with ricotta. I’m also in love with the soothing flavor of the overnight oats in Bear’s Bounty ($5): a parfait-like cup that layers them with chia pudding, berries, and nuts. What a great little cafe. Big Bear Cafe + Espresso Bar, 3 Eastern Ave., Dedham, 781-375-2194, www.bigbearinthesquare.com. .